Today is the beginning of this year’s (2016) Hajj (حج‎), the annual Islamic pilgrimage to Mecca which is a mandatory religious duty for Muslims that they are under obligation to carry out at least once in their lifetimes provided that they are physically and financially capable of undertaking the journey, and can support their family during their absence (istita’ah). It is one of the five pillars of Islam, alongside Shahadah (canonical creed), Salat (daily prayer), Zakat (charity), and Sawm (fasting). Hajj is now one of the largest annual gatherings of people in the world. The pilgrimage occurs from the 8th to 12th (or in some cases 13th) of Dhu al-Hijjah, the last month of the Islamic calendar. Because the Islamic calendar is strictly lunar, the Islamic year is about eleven days shorter than the solar Gregorian year. Therefore, the Gregorian date of Hajj moves back incrementally from year to year. 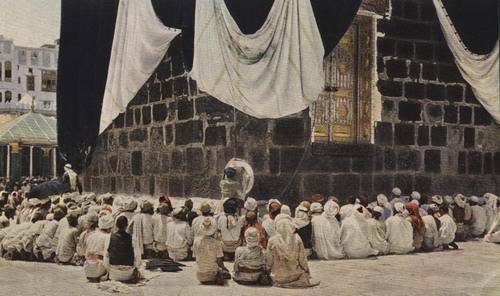 The Hajj is associated with the life of Islamic prophet Muhammad from the 7th century, but elements of the ritual of pilgrimage to Mecca are considered by Muslims to stretch back thousands of years to the time of Abraham (or Ibrahim in Arabic). During Hajj, pilgrims join various processions of hundreds of thousands of people, who simultaneously converge on Mecca for the week of the Hajj, and perform a series of rituals. In theory each person walks counter-clockwise seven times around the Ka’aba (the cube-shaped building and the direction of prayer for all Muslims worldwide), runs back and forth between the hills of Al-Safa and Al-Marwah, drinks from the Zamzam Well, goes to the plains of Mount Arafat to stand in vigil, spends a night in the plain of Muzdalifa, and performs symbolic stoning of the devil by throwing stones at three pillars. The pilgrims then shave their heads, perform a ritual of animal sacrifice, and celebrate the three-day global festival of Eid al-Adha. Because the pilgrims number in the millions now it is not possible to perform all of these actions as formally specified, so there are acceptable substitutions. For example, pilgrims can buy tokens for food to be distributed to the poor in place of animal sacrifice. According to the Qur’an, some components of Hajj trace back to the time of Abraham, conventionally dated around 2000 BCE. By Islamic tradition, Abraham was ordered by God to leave his wife Hagar (his concubine according to Torah) and his son Ishmael alone in the desert of ancient Mecca. In search of water, Hagar desperately ran seven times between the two hills of Safa and Marwah but found none. Returning in despair to Ishmael, she saw the baby scratching the ground with his leg and a water fountain sprang forth underneath his foot. Later, Abraham was commanded to build the Ka’aba (which he did with the help of Ishmael) and to invite people to perform pilgrimage there. The Qur’an refers to these incidents in verses 2:124-127 and 22:27-30. It is said that the archangel Gabriel brought the Black Stone from Heaven to be attached to the Ka’aba. In pre-Islamic Arabia, a time known as jahiliyyah, the Ka’aba became associated with religious idols. In 630 CE, Muhammad led his followers from Medina to Mecca, cleansed the Ka’aba by destroying all the idols, and then consecrated the building to Allah. In 632 CE, Muhammad performed his only pilgrimage with a large number of followers, and instructed them on the rites of Hajj. 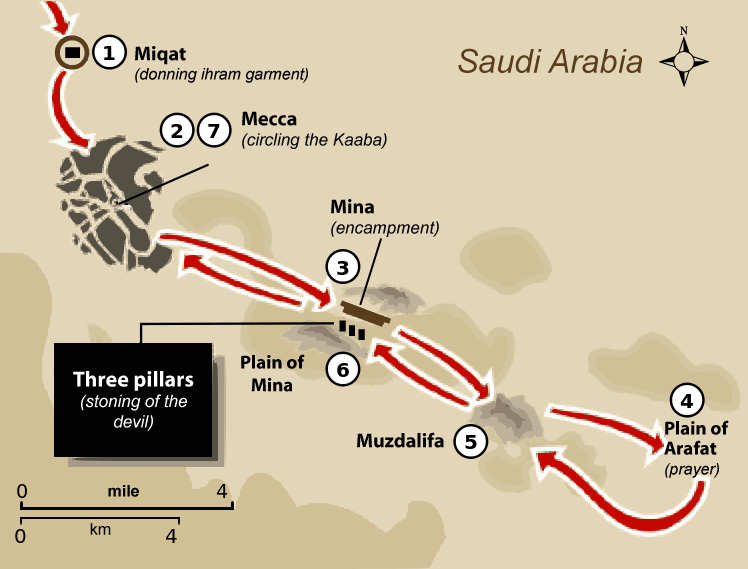 It was from this point that Hajj became one of the five pillars of Islam. During medieval times, pilgrims would gather in big cities of Syria, Egypt, and Iraq to go to Mecca in groups and caravans comprising tens of thousands of pilgrims, often under state patronage. 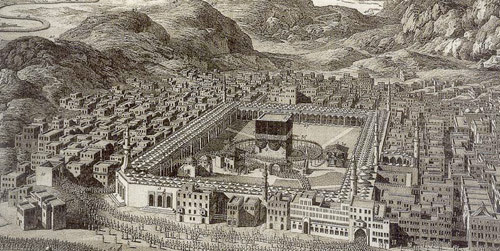 Hajj caravans, particularly with the advent of the Mamluk Sultanate and its successor, the Ottoman Empire, were escorted by a military force accompanied by physicians under the command of an amir al-hajj. This was done in order to protect the caravan from Bedouin robbers or natural hazards, and to ensure that the pilgrims were supplied with the necessary provisions. Muslim travelers, such as Ibn Jubayr and Ibn Battuta, have recorded detailed accounts of Hajj-travels of medieval times. The caravans followed well-established routes called in Arabic darb al-hajj, lit. “pilgrimage road”, which usually followed ancient routes such as the King’s Highway. 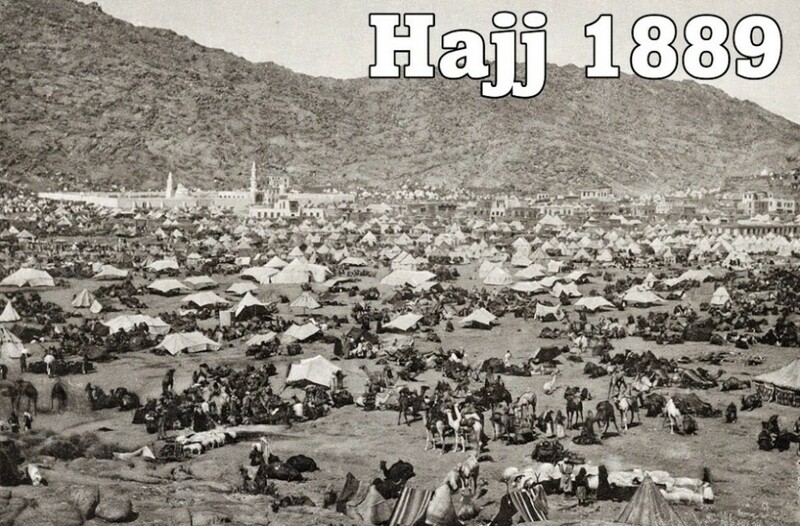 Until the 20th century the Hajj was generally manageable, although complex and hazardous, in terms of numbers of pilgrims. In the 1920s numbers were actually falling from a peak of about 60,000. But then the trend reversed itself so that there were about 100,000 pilgrims in 1950, and, with the advent of cheap air travel, had reached over 3 million by 2012. 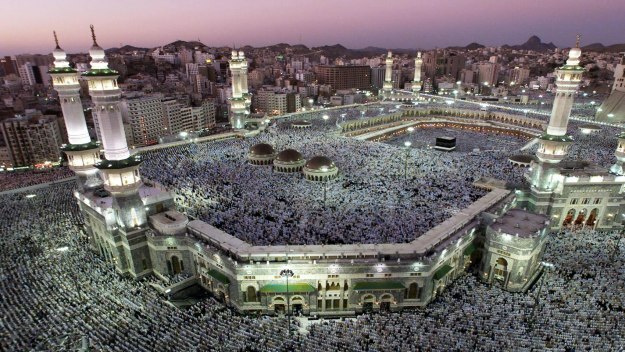 The following year the Saudi government limited the number of pilgrims to around 2 million in order to better manage security, transportation, accommodations, sanitation, and food. Even so there have been tragic incidents. In 2015 somewhere between 2,000 and 4,000 pilgrims were killed in a stampede (official reports vary), and such incidents are not uncommon. Thousands have died in stampedes in the past 25 years. 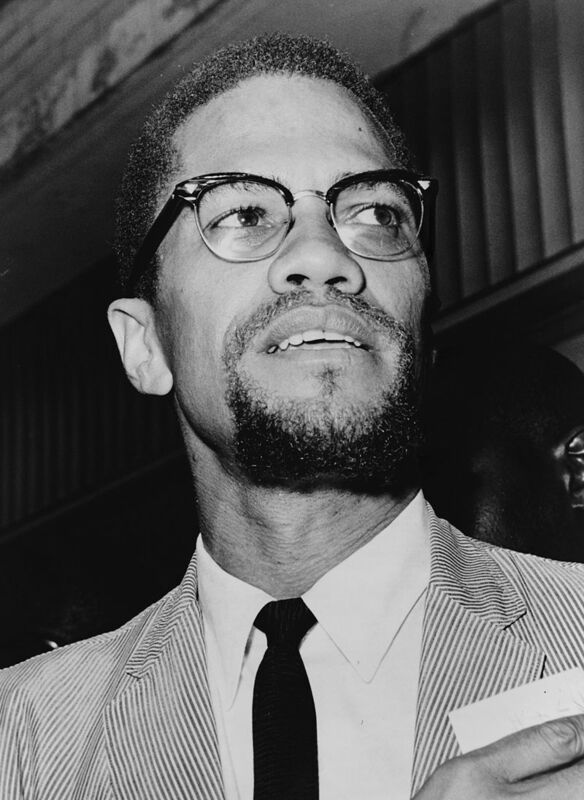 In April 1964 celebrated civil rights activist, Malcolm X, performed the Hajj after he had left the Nation of Islam and become a Sunni Muslim. In his Autobiography (as dictated to Alex Haley), he recalls how the Nation of Islam had turned his life around in prison where he was serving time for robbery, but he had become jaded with the loose morals and corruption of leader Elijah Muhammad and decided to quit despite becoming a celebrity within the movement. Several Sunnis approached him and, having converted, convinced him to go on the Hajj. This was to be a transformative event for Malcolm. There were tens of thousands of pilgrims, from all over the world. They were of all colors, from blue-eyed blondes to black-skinned Africans. But we were all participating in the same ritual, displaying a spirit of unity and brotherhood that my experiences in America had led me to believe never could exist between the white and the non-white. America needs to understand Islam, because this is the one religion that erases from its society the race problem. You may be shocked by these words coming from me. But on this pilgrimage, what I have seen, and experienced, has forced me to rearrange much of my thought patterns previously held. Well, that was over 50 years ago. Certainly, civil rights for African-Americans in the U.S. have improved since then, but you can hardly say that these Islamic ideals have prospered. In fact Muslims have joined the growing ranks of despised minorities in the U.S. Malcolm’s experiences should have been a lesson. Instead he was murdered. The state of holiness known as Ihram has as one of its tenets the notion of the absolute equality of all pilgrims in the eyes of God. To this end, all male pilgrims wear the same garb: two white seamless cloths, with the one wrapped around the waist reaching below the knee and the other draped over the left shoulder and tied at the right side. Women wear ordinary dress that fulfills the Islamic condition of public dress with hands or face uncovered. There are prescribed ablutions in preparation, and during th pilgrimage participants must refrain from certain activities such as clipping the nails, shaving any part of the body, having sexual relations; using perfumes, damaging plants, killing animals, covering the head (for men) or the face and hands (for women); getting married; or carrying weapons. Beyond the usual Muslim limitations, there are no general food prohibitions for the days of Hajj as in the month of Ramadan http://www.bookofdaystales.com/ramadan/ , although some of the specific rituals, such as circling the Ka’aba, must be done while fasting. The meat plus rice dishes of South Asia and the Middle East – biryani, pilaf etc. – are great dishes for the Hajj days. They are easy to make in large quantity and, as these photos show, are great for communal eating. Al kabsa is perfect because it is a national dish of Saudi Arabia where Mecca is located. No surprise that al kabsa can be made numerous ways. It is a complexly spiced dish and nowadays pre-mixed spices are sold for it. I have the same feeling about this as I do about curry powder – that is, I hate it. Make the mix yourself. Some cooks us whole spices, some ground. I prefer ground, but you can take your pick. My favorite method is to brown some onions, then some chicken. Then add spices and sauté to bring out the flavor. Next add stock and tomato paste (or crushed tomatoes) and simmer until the chicken is cooked (about 30 minutes). Remove the chicken and set aside. Add rice to cook in the chicken broth. When the rice is almost cooked, briefly finish off the chicken by grilling it over charcoal or roasting in a pit oven. Bring the dish together by serving the rice on a large platter, mixing in the chicken, then sprinkling with chopped nuts and raisins. Serve with sliced cucumbers, yoghurt, and flat bread. Here’s a suggestion for ingredients. Of course you can vary the amount and type of spices. This version is common.